Jelly Cakes and Robert E Lee Cake [married Washington’s great granddaughter who inherited Arlington House], also had jelly between the cake layers. A few recipes such as Godey’s Lady’s Book, 1870 or Housekeeping in Old Virginia, 1879 had applesauce between the layers of the Washington Pie. Starting in the 1880s, cream or custard, white or chocolate was being used between the layers, and in the early 1900s that was the most popular. The White House Cookbook, 1889 said it was similar to Boston Cream Pie, the difference was adding half an ounce of butter. The magazine for the Boston Cooking School: “Query No. 2666. — "Recipes for 'Boston Pies,' the ones made under the names of 'Washington Pie,' 'Washington Cream Pie,' and 'Chocolate Washington Pie?'" The finished cake would be topped with powdered sugar, iced, "...frosting, made of sifted confectioners' sugar and hot milk or water with a little flavoring, makes a good finish for the top of these cakes, though quite as often they are finished by simply sifting a little confectioners' sugar over the top.” [American Cookery, 1921 ] or “…decorate the top with angelica and cherries, maraschino style. Cover the decoration with a glaze made of apricot jam, strained fine.” [American Cookery. Boston: 1921 (Boston Cooking School)] photo above. George Washington was the inspiration for the name of this cake. In several early cookbooks the recipe preceeded recipes for LaFayette Cake, and Bliss, 1850 said “This cake is sometimes called Washington Pie, Lafayette Pie, Jelly Cake, &c.” Washington’s Birthday Cake was the title of the recipe in the 1921 Boston Cooking School magazine. Beat to a cream half a pound of butter and half a pound of white sugar; then stir in eight eggs well beaten, one glass of rose-water, and one pound of sifted flour; bake in shallow and circular tins half an inch deep; when done, spread a thick layer of raspberry jam, or any marmalade or jelly, upon one cake and lay another cake upon the top of the jam, and sift white sugar over the whole. 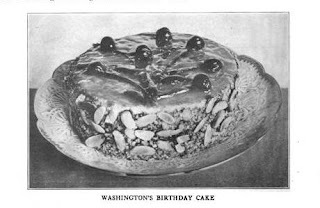 This cake is sometimes called Washington Pie, Lafayette Pie, Jelly Cake, &C.
Cream Filling—Put 1 pint of milk to boil in double boiler, beat 2 eggs very light, mix 1 cup of sugar 1/2 cup of flour and stir into eggs beat wel1 and add to boiling milk, butter size of hickory nut, melt 1/4 pound of Baker's chocolate add to the cream, flavor with vanilla, when cold spread between the cake. Custard Cake or Martha Washington Pie. Three eggs, one and a half cups of sugar, one-half cup of cold water, two cups of flour, two iieaping teaspoons of baking powder. Beat eggs and sugar five minutes with Dover egg beater. Add other ingredients and beat well. Bake in three tins in a very moderate oven. Filling.— One and a half cups of rich milk, one-half cup of sugar, yolks of two eggs, two scant tablespoons of cornstarch. Heat milk in double boiler, cream sugar, starch and egg yolks, add to hot niilk and stir until well cooked. Flavor with lemon. Put between the layers. Frosting.— Whites of two eggs beaten stiff, eight tablespoons of finest confectioners' sugar, one square chocolate melted. Cover the top and sides of cake. Flavor with vanilla. Isn't the sponge-cake-and-jam version of Washington Pie nearly identical to Britain's Victoria Jam Sandwich?